Here are the wildfires for Monday, June 19, 2017. Do we have one missing from this list? Check us out and let us know. The Bogus Fire was reported on June 19, 2017 by CAL Fire which is burning off of Ager Beswick Road and Crest Lane and South of Copco Lake in Siskiyou County. The Highway Fire is burning on the Sequoia National Forest, about 5 miles SW of Bodfish. The fire has consumed 500 acres of tall grass and brush. Its fire behavior remains as extreme and has a 0% containment status. There are 370 personnel attached alongside 13 crews, 17 engines and 6 helicopters. The Lake Fire is located 1 mile NE of Castaic and on the Angeles National Forest. There have been 800 acres of chaparral and tall grass destroyed. Its fire behavior has dropped to minimal that is now creeping and smoldering with a 20% containment status. There are still 465 personnel assigned to this fire incident along with 15 crews, 25 engines and 3 helicopters. CAL Fire has reported that the Smiley Fire started on June 18th @ 1510 hours from an unknown cause which Law Enforcement officials are currently investigating. The fire is located North of Moreno Valley in Riverside County. There are currently 3 engines assigned to patrolling and improving containment lines to the 100% contained wildfire but resources soared to 9 firefighters, 3 engines and 2 water tenders. There was one minor injury reported. The Trellis Fire is North of Lake Elsinore and State Highway 74, near Trellis Lane in Riverside County has been reported as 100% contained, leaving 26 acres destroyed by an unknown cause. The fire was reported on June 18th around 1603 hours. 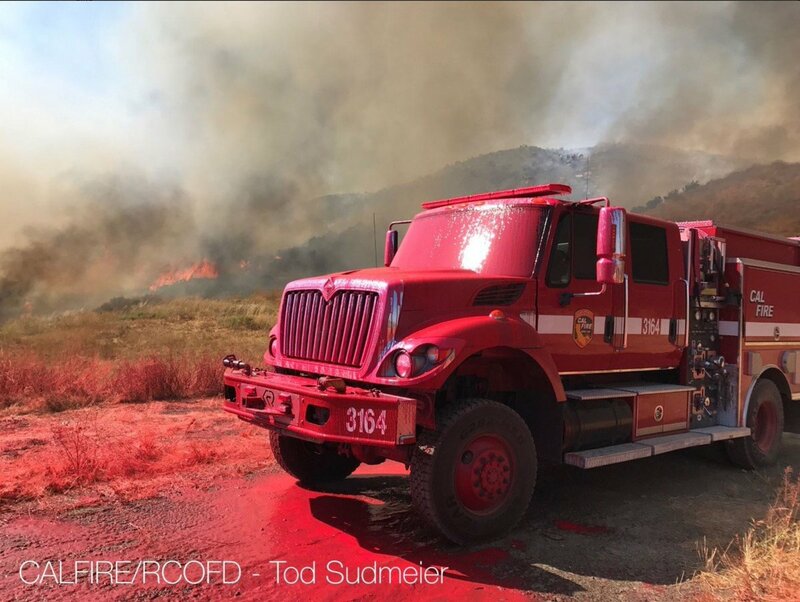 Resources from CAL Fire – Riverside, CHP, City of Corona FD, Murrietta FD, Riverside County FD and Riverside County Sheriff Office were dispatched along with 45 firefighters, 12 engines, 1 truck and 3 overhead personnel. Come follow us here, on our Facebook Page and Twitter Page (@nwfireblog) or drop us a line at nwfireblog@comcast.net. Please no advertisements or spam emails. Disclaimer: All Fire Images in this post respectfully belong to each contributor and we do not lay claim on them, Copyrights are listed to the best of our knowledge. – Ed. ← ARIZONA | MAGGIE FIRE | NEW!